Since I have been making a concerted effort to eat more veggies, especially at lunch time, I've also discovered the importance of a good sauce. If I just eat a bunch of raw veggies, it's fine and yummy enough - but it feels like I just had a snack, and not like I got to have lunch. Even a plate of plain steamed veggies just feels a bit blah. But! If I have a nice sauce that I can pour on, or mix in with the veggies, or dip the veggies into - suddenly the whole mood changes. Suddenly it feels like a bonafide meal! Some of my most favorite sauces lately have been tofu ricotta, homemade queso, and the Green Goddess dressing from Appetite for Reduction... I try to look for sauces or dips that are high in flavor, but not super rich or fatty, since I'm usually trying to keep my calories down. 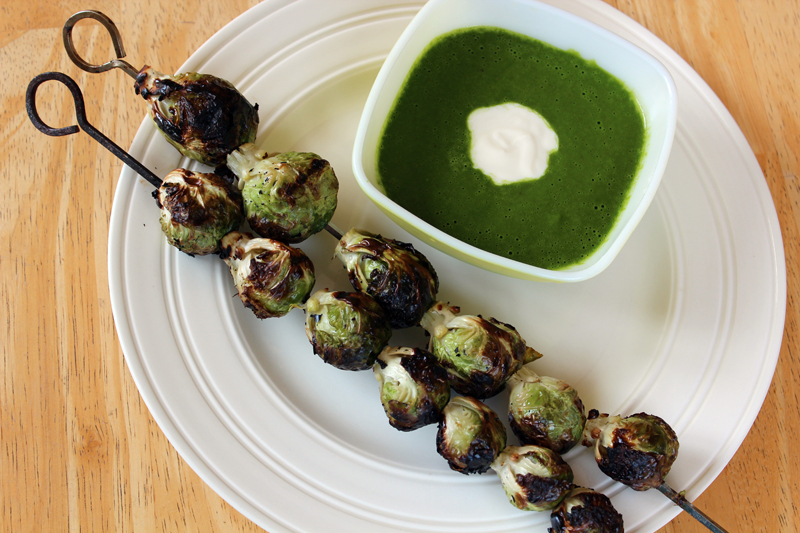 Yesterday I finally made the grilled Brussels Sprouts kabobs I've been wanting to try (fun! yum! 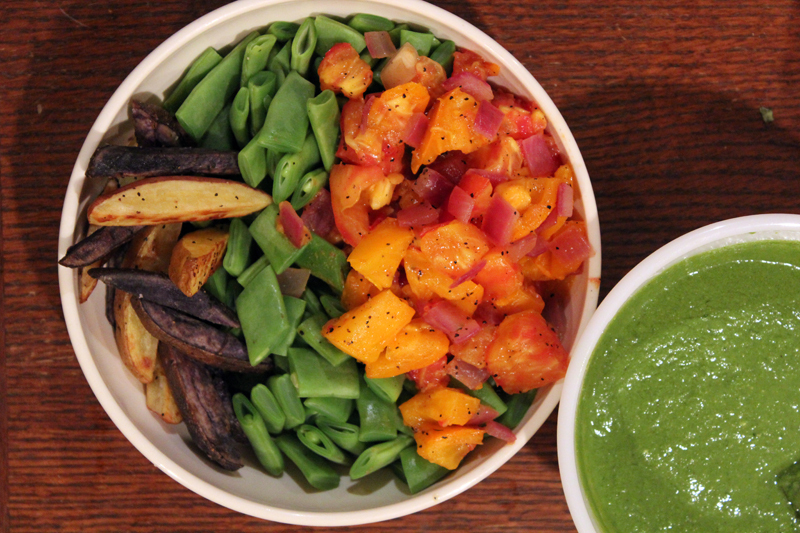 ), and I made a batch of spinach-basil sauce to go with them. I used a recipe from Healthy Hedonist - it's got jalepeno and light coconut milk and a whole pound of spinach and ginger and lemongrass.... positively packed with flavor. In truth, I don't think it was the best match with the brussels sprouts, but that's okay because they were just great on their own. I still have a lot of that sauce left over, so I'll have to come up with some other uses for it. I love how brilliant and green it is! I find that having one or two sauces/dressings/dips on hand in the fridge greatly increases my chances of eating veggies, and decreases the chances that I will just nibble mindlessly all afternoon. Last week I even tried my hand at coming up with my own sauce. It had parsley and garlic and almonds and lemon juice. It was pretty lame. Just sorta thin and unremarkable in the flavor department. But luckily, Mr. VE&T came into the kitchen, and he had all sorts of good ideas. He added some of my homemade soy yogurt, and some tamari... and suddenly the whole thing was much more interesting and delicious. Mr. VE&T is always encouraging me to make up recipes on my own, but I don't feel like I'm good at it at all. He's the one with all the ideas! He came waltzing in and made my lame-o sauce into something tasty and worthwhile. I keep suggesting to him that he develop a passion for vegan cooking! ha ha. In the end, we had our sauce with oven fried potatoes, steamed romano beans and some lightly sauteed tomatoes and onions. It turned out to be a pretty good dinner! So, what are your favorite dressings / dips / sauces? I gotta expand my repertoire! 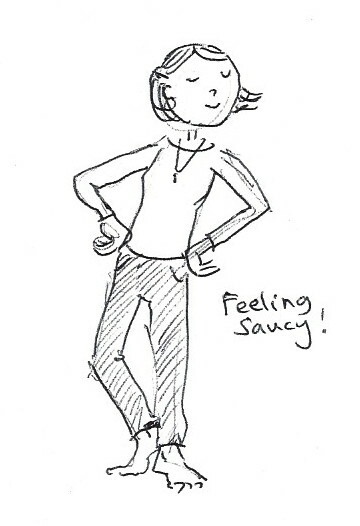 my attempt at drawing myself feeling "saucy"
oh, good idea! I should make ranch more often - it's so versatile. I am no good at making up savory recipes either! 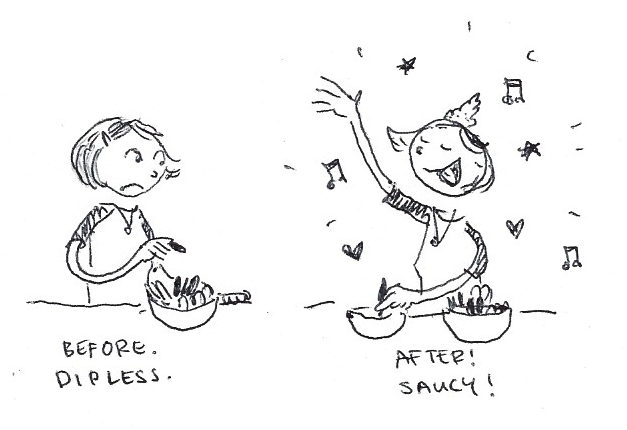 I once tried to make a version of a pasta dish I'd had at a restaurant at home and it was so oily and terrible! I am much better off with a cookbook infront of me. I totally agree about a good sauce though, I always forget to keep one in the fridge at all times and just end up having cereal or toast! I love the one that goes on the roasted cauliflower and soba bowl from the PPK / Isa does it, it's especially good with the sprinkle of dill ontop. Oh and I bookmarked a cauliflower Queso on Cadry's blog that I'm gonna make soon, it looks great! I have that one from Cadry bookmarked too!!! Thanks for the reminder. I love cauliflower so much! I tried to make my own cheesy sauce with seeds and nutritional yeast a couple of days ago. Not good. I don't think Mr. VE&T could have saved that one. I ate it anyway because I hate wasting food but it wasn't exactly the most enjoyable dinner I've ever had. Your Brussels sprouts look so yummy! I always eat whatever I make too. Even if it was bad. It has to be REALLY bad for me to not eat it. I love blending a little cashews with water, lemon, chile, salt, giner, and tons of cilantro for an indian style sauce. you could use coconut flakes instead of the nuts, too. mmm! I never make indian-style sauces. good idea! You are so right! It does feel more like a meal if you have a fantastic sauce to go with it! Thank you for causing brussels sprouts to make my mouth water! Those look soo amazing! they were great, Heather! I usually just roast them, but grilling them was fast and easy! You are so saucy. ;) I am the worst at making up recipes, which is why my blog has no recipes! I love a good sauce. One of my favourites is miso tahini (the one in Isa Does It is particularly delicious), but I also love cheese sauce (Three Nut Cheeze Whizz from Quick Fix Vegan is easy and great). Satay sauce is another favourite, but can be a bit rich! I love hummus as well, and will sometimes thin out a bit of hummus to drizzle over. I haven't tried any of the sauces from Isa Does It yet. I really haven't made much from that book! Also, thanks for the thinned out hummus reminder - I find that makes a great sauce, but I had sorta forgotten about it. So easy! I like tahini sauce a lot -- just tahini, lemon juice, crushed garlic, salt, and then enough water to thin it out -- great on falafel, but also just about everything else. Muhammara is another favorite when it comes to middle eastern flavors. Also, peanut sauce -- peanut butter, soy sauce, sesame oil, lime juice, vinegar, garlic, ginger, and sriracha/sambal/thai chilies blended together and thinned with water. The peanut sauce is also good if you thin it out with coconut milk rather than water and/or if you add in some curry paste or curry powder for an extra dimension. whoa! your saucy ideas sound super good!!! Thanks for such great ideas! I have a very small sauce repertoire. Either tahini and herbs, or tahini-miso! Everyone else's ideas sound really good though! 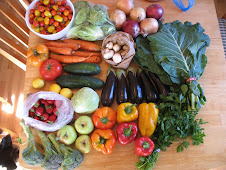 And brilliant on yr part to step up the veggie game, yr right how it changes it into a meal. it's pretty hard to go wrong with tahini. It's one of my standbys too.